The 2015 edition of Harris Outdoor Groups’ Concealed Carry Handguns is on newsstands now! This annual favorite is filled with all sorts of handgun specs for models favored by concealed carry permit holders. There are also a number of articles including budget guns and a state by state summary of carry laws. Most readers would pick this volume up for the 275+ gun listings which only occupies less than 20% of the page space. This listing is broken down into semi-autos, revolvers and derringers/others. Models are listed 8 to a page with appropriate color pics and specs. Given that this volume is dedicated to concealed carry models, it would be much more useful for the reader if each gun listed those physical dimensions that readers need to take into consideration when determining if they could successfully carry a particular gun. While weight and barrel length are given, there is no mention of length (not so important), width (important) and height (very important). The publisher should at least consider aiding the reader by at least breaking them down in full-size, compact, subcompact and pocket models (although this is a challenging goal since there are no definitive specs on where the boundaries between those categories lies). The articles vary widely in their scope of coverage from mini-reviews of particular handgun models to those on holster selection, carry methods and state laws. The one on state laws covers all 50 states in 3 pages so you can’t expect a lot of detail. The most useful info provided is a link to each state’s governing body regarding firearms and/or concealed carry laws. The number of pistols covered in the various mini-reviews is right around 50 with models made by Glock, Kimber, Bond Arms, American Derringer, Smith & Wesson, Colt, Sig Sauer, North American Arms, SCCY, Taurus, Kahr, Beretta and Springfield Armory. The other support articles cover such topics as picking the right holster, carrying full sized models, the pros and cons of inside and outside the waist band carry, carry options for women, items for every day carry gear and the proper mindset for those who carry every day. 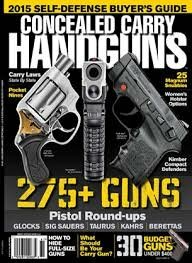 Every magazine these days is loaded with advertisements and while they can be annoying at times, they also give you an idea of all the different options available to concealed carriers whether it’s handguns, flashlights, holsters, ammunition, safes, laser sights, night sights, cases, target systems and the list goes on and on. If you are in the market for a new concealed carry pistol this would be a good place to start. I buy a copy every year to help keep up to date on all that’s available. I also use it to keep the stats in my book, Buying Your First Handgun, up to date. So look for it at your local newstand or book store today. It will set you back $10 but the amount of information you gain is invaluable.